This paper attempts to address the concept of self in three variables that are self-esteem, self-efficacy and self-monitoring among teachers and educational managers. 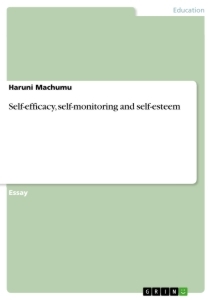 The main purpose of this paper is to express the practical implications of the self (self esteem, self efficacy and self-monitoring) to educational managers. It also focuses on the influences of success and failure of an individual to achieve organizations goals. Self-esteem is a term used in psychology to reflect a person’s overall evaluation or appraisal of his/her own worth. It is said to be a degree to which a person has a positive self-evaluation which encompasses beliefs and emotions such as success, despair, pride and shame. Teacher’s self-esteem may be reflected in their behaviour, such as in assertiveness, shyness, confidence or caution. It is one of self-evaluation between overall evaluation of what you can do and what you cannot do. There are two types of self-esteem that are high and low esteem. High self esteem is the result of self quality images and if teachers have a high level of self esteem will be confident, happy, highly motivated and most important have the right attitude to succeed. On the other hand, low esteem emanate from unfavourable self image that lead to poor confidence and negative attitudes towards working and makes them believe negative comments as a results they lose confidence and give-up easily rather than facing challenges accordingly (Johns, 2007 p.79). Thus, self esteem is crucial and cornerstone of a positive attitude towards working better, as it affects how we think, act and even how we relate to other people. Within educational organization, educational managers should be aware that self-esteem makes an essential contribution to the life process of teachers, and it is indispensable to normal and healthy self-development, and has a value for survival of organization. Second, it is an automatic and inevitable consequence of the sum of individuals’ choices in using their consciousness. For example those teachers with high esteem tend to perform better in their daily activities while those with low esteem tend to react badly on negative feedback and this lowers their subsequent performance. That means that educational mangers should be cautious and punishment to teachers with low self esteem. Third, educational managers are advised to employ managerial strategies such as rewards, praise, and reinforcement to push up high self esteem among teachers since it ensure positive performances that lead organization success. This can be seen in those schools that have tendencies of pushing high esteem to their teachers and students through encouraging participation on decision making, self-discipline-control, providing technical expertise and feedback to other. Another implication is that educational managers should direct criticism at the performance difficulty and not the person. Educational managers should be aware that self esteem is a concept of personality, for it to grow, we need to have self worth, and this self worth will be sought from embracing challenges that result in the showing of success among teachers themselves. For instance, a workforce with high self-esteem teachers is beneficial to schools since such teachers tends to make more fulfilling career decisions, they exhibit high job satisfaction, and they are generally more resilient to the strains of everyday work life. Self-efficacy is defined as people’s beliefs about their capabilities to produce designated levels of performance that exercise influence over events that affect their lives. The concept was first introduced by Bandura in 1986, who argues that self-efficacy is the belief that one can do the behaviours necessary to achieve a desired outcome (Larsen and Buss, 2005, p.584). Self-efficacy beliefs determine how people feel, think, motivate themselves and behave. Such beliefs produce diverse effects through four major processes that include cognitive, motivational, affection and selection processes that fall depends on prior experiences, behavior model, persuasion from others and assessment of physical/emotional state. A strong sense ofself- efficacy enhances human accomplishment and personal well-being in many ways. For example, some teachers believe confidently that positive discipline among students and teachers is a pillar of academic success. People with high assurance in their capabilities approach difficult tasks as challenges to be mastered rather than as threats to be avoided. Such an efficacious outlook fosters intrinsic interest and deep inclination in activities (Larsen and Buss, 2005, p.587). There are number of characteristics of teachers with high self-efficacy such as set challenging goals and maintain strong commitment to achieve goals, heighten and sustain efforts in the face of failure, quickly recover sense of efficacy after failures or setbacks, attribute failure to insufficient effort or deficient knowledge and skills which are acquirable and approach threatening situations with assurance that they can exercise control over them. Such an efficacious outlook produces personal accomplishments, reduces stress and lowers vulnerability to depression in workplaces. On contrast, teachers who doubt their capabilities shy away from difficult tasks which they view as personal threats, have low aspirations and weak commitment to the goals they choose to pursue. Also, when faced with difficult tasks dwell on their personal deficiencies, on the obstacles encountered and all kinds of adverse outcomes rather than concentrating on how to perform successfully. Slacken their efforts and give up quickly in the face of difficulties and are slow to recover their sense of efficacy following failure or setbacks since they view insufficient performance as deficient aptitude it does not require much failure for them to lose faith in their capabilities. They fall easy victim to stress and depression. During recruiting, selection and job assignment to teachers’, educational managers needs to know previous experiences or performance attainment by teachers that determined success or failure. This can enable educational managers to select teachers with high-self efficacy by using previous experiences. Also a complex, challenging and autonomous jobs tend to enhance perceived self-efficacy expectation to teachers so that they can make right decisions. Another implication of self-efficacy to educational management is that teachers should be trained, developed frequently and involved in decision making through seminars on goal setting, self direction and self evaluation, mentoring. Again, educational mangers should develop and ensure self-management and systematic training to enhance self-efficacy in educational institutions. Goal setting and quality improvement; goal difficulty needs to match the teacher’s perceived self-efficacy. Also top educational management need to develop and gives leadership talent surfaces to prove themselves under pressures and rewards accordingly (enhance pedagogical leadership within an organization). The term self-monitoring was first proposed by Mark Snyder in 1974 as a contribution to the psychology of personality. It refers to the process through which people regulate their own behavior in order to look good since they will be perceived by others in a favorable manner. As Johns (1996, p.78) put it “self-monitoring is the extent to which people observe and regulate how they appear and behave in social settings and relationships”. So persons fall in two categories in natures, the high self-monitors and low self-monitors. These two distinguishable types of self-monitoring are employed in a wide-ranging educational management organization to motivate teaching and non-teaching staff. Teachers who have high sensitivity their behavior tend to show concern for socially appropriate behaviours, tune in to social cues and regulate their behavior according to those cues in order to fit different situations (Kreitner and Kinicki, 2007, p.147). It is argue that high self-monitoring teachers immense to observe and control the images that they project. In addition to that high self-monitoring teachers are consisting of the following characteristics: high concern with the social appropriateness of one’s actions; use of social comparison information; ability to monitor one’s behavior to fit different situations; ability to do this in specific situations; and attribute variability (Johns, 1996, p.79). On the other hand, teachers with low sensitivity to environment are called people who are living in the world. They have nothing to do more than what they know, feel and believe on their capacity, they tends to run away from challenges, having a thought to lack either the ability or the motivation to regulate their expressive self. The following are practical implications that provide a lesson to educational mangers and other practitioners. First, educational mangers should be sensitive that trait consistency can be found in low-self-monitors teachers, whereas teachers with environmentalist framework are more appropriate for high-self-sensitivity. For example, teachers are differing in adopting environment; there are those who are able to work at any kind of environment i.e. remote village with poor social services and other end up blaming others. Second, educational management need to change accordingly so that they can be able to accommodate other behaviours. Third, some teachers are sensitive to how other sees them; thus they to work hard and behave properly in order to achieve high all the time, whilst others are not. Teachers who are high self-monitors in educational management constantly watch other people, what they do and how they respond to the behavior of others. Such teachers are hence very self-conscious and like to ‘look good’ and will hence usually adapt well to differing social situations. On the other hand, low self-monitors are generally unmindful to how other see them and hence match to their own different situations. Managing teacher’s behaviour in schools has great concern in educational organization, since managing teacher’s means dealing with diversity, and in order to achieve organizational goal as well as individual goals educational managers must study the collectivity of organization. Working behaviour of teachers depends in high degree to their historical background, school attended, economic status and family modes of life. Self-monitoring, self-efficacy and self-esteem are shaping tools to teachers in order to adopt certain circumstances.